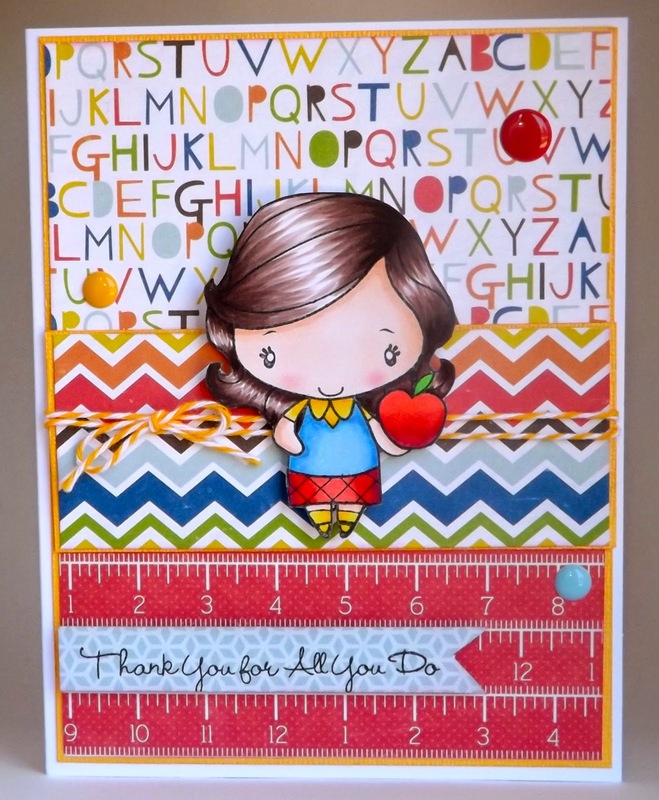 Loves Rubberstamps Blog: Celebrating the end of the school year with a teacher card! Celebrating the end of the school year with a teacher card! Hello, It's Marcy with some inspiration for you all today! So this Friday was the end of the school year! I can't believe how fast this year went but I'm so looking forward to the Summer which is my favorite time of the year! With having 3 kids, I had a lot of teacher cards to put together. This is one I made for my son, Ethan's preschool teacher. She is such an amazing teacher and such a sweet person too! I had a lot of fun pulling out one of my favorite teacher images called Teacher Anya by The Greeting Farm. I colored her up with my Copic Markers and used some fun school design papers in the background which came from a collection called Paper and Glue by Echo Park. This collection is perfect for school themed projects! I added some enamel dots from My Mind's Eye and some twine to finish off my card. Be sure to stop by the Loves Rubberstamps store to see the items used on my card and so much more! We also have the "Sensational Sunday" blog hop tomorrow so hope you stop by again to visit and join in!